In this recipe of dahi arbi, I have added dahi later because if you are not used to cooking with yogurt and you add it in the beginning, you may end up getting lumps. I cook dahi wali arbi separately as well as combine it with potatoes to make dahi aloo arbi. 1. Heat oil in a kadhai or a pan. Add rai and let it splutter. 2. Add hing and after 2 seconds add green chillies. 3. After 1 minute, add arbi and 1 cup water. Add salt and all the spices except garam masala. 4. Cook till gravy thickens. Add dahi and cook, stirring, on a low heat for 2 minutes. Add garam masala and cook on a low heat for 1 minute. 5. 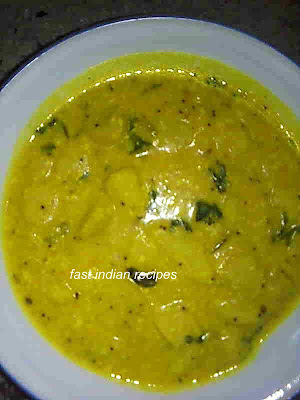 Turn off the heat and garnish dahi wali arbi with coriander leaves. nice way of cooking Arbi... I generally cook with coconut.. yogurt sounds interesting..